A trip to Jaipur in January has the potential to be one of the most incredible trips of the year. The city is abuzz with events like the Jaipur Literature Festival, Jaipur Film Festival, and many others. The biggest celebration, of course, is Makar Sankranti which is celebrated on January 14 to honour and welcome the winter harvest each year. This is one of the most auspicious time in the Hindu calendar and the day is grandly celebrated around the country. But Jaipur takes it one step further with its vibrant kite festival also known as Makar Sankranti. The festival kickstarts at the Polo Grounds in Jaipur where entertaining performances are held marking the beginning of celebrations. Then there’s dancing, music, and lights on the streets; homes decorated beautifully and colourful kites flying over almost every terrace. Interestingly, the residents don’t just buy ordinary kites; they head to the markets of Handipura, Kishanpol Bazaar, and Haldiyon which are known to sell great quality thread and maanjha (glass covered thread) for years together. On the morning of Makar Sankranti, it’s quite a sight to see the locals flock to Galtaji Temple to take a dip in the natural reservoirs called kunds. The reason for doing this is that they believe it absolves them of all their sins. You could also take a part in it if it catches your interest. The most remarkable tradition during Makar Sankranti is the Kite Festival. 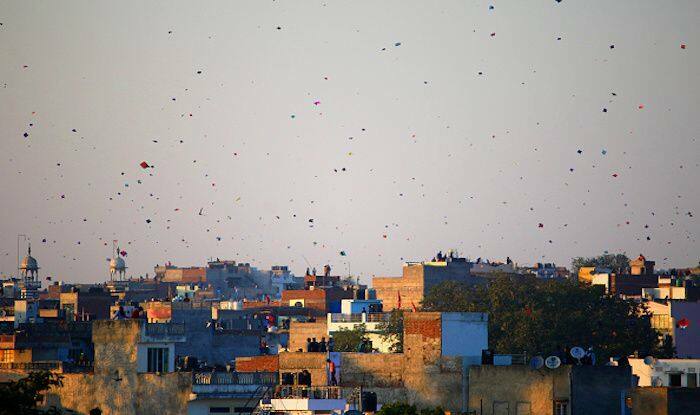 Every resident in the city takes part in the festivities by flying kites from their terrace. In fact, the city holds a Dangal competition, where the fliers try to cut the threads of their opponents to win. Whether you win or not, you are treated to special treats that are made during this time. Items like Daal Ke Pakore, Daal-Baati-Churma, Sooji Ka Sheera, Paushbara, and Bajre Ka Kichra are prepared in every household. You can also gorge on delicious sweetmeats like Pheni, Gajak, Rewari, and Til Ke Ladoo. Keep an eye out for the fireworks at night; a million floating lamps are sent up into the sky, making the festival seem a mini Diwali.